Imagine living outdoors and not being able to move. No walking, talking, or texting—nothing, not even seeing or hearing! The things we do as part of our everyday lives would immediately become challenges. From where would we get our food? How would we eat, get rid of wastes, or reproduce? The simplest things like taking a drink of water would be impossible. We would certainly perish! No matter whether you imagined yourself in a city, on a mountain, valley, desert or forest, or even in someone’s back yard, in winter or in summer—survival would be impossible. These are the many challenges faced by plants. All plants are specialized to survive on land. They make their own food; they have ways of obtaining water and ways to avoid losing it. The plants in the Seed-Producing Plants biology study guide unit produce gametes specifically adapted for dispersal without depending on water, and as a result have a more successful terrestrial existence than the seedless plants considered in the previous unit. In some respect, seeds are like the spores of the seedless plants; both are genetic packages capable of growing into organisms. Seeds, however, unlike spores, are embryonic—the result of fertilization—and they contain a food source to satisfy the nutritional requirements of the new plant until it becomes truly autotrophic: able to feed itself. 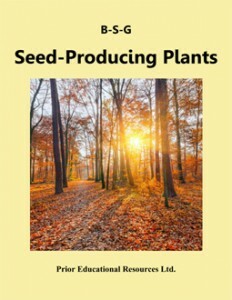 Seed-Producing Plants is excerpted from our Biology 11 Study Guide, which is the fourth edition of a student study guide written to match the curriculum of British Columbia. The concepts presented are applicable to the biology curricula of other educational jurisdictions as well. A set of Build Your Understanding questions designed to push you beyond the limitations of this unit. Note: Discussion Questions and Build Your Understanding questions are not linked to their answers. Copyright Prior Educational Resources Ltd.